Written by an international team of leading scholars, this groundbreaking reference work explores the nature of language change and diffusion, and paves the way for future research in this rapidly expanding interdisciplinary field. Features 35 newly-written essays from internationally acclaimed experts that reflect the growth and vitality of the burgeoning area of historical sociolinguistics. Examines how sociolinguistic theoretical models, methods, findings, and expertise can be used to reconstruct a language's past in order to explain linguistic changes and developments. Bridges the gap between the past and the present in linguistic studies. 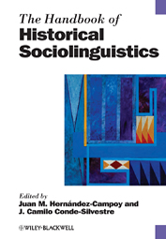 Structured thematically into sections exploring: origins and theoretical assumptions; methods for the sociolinguistic study of the history of languages; linguistic and extra-linguistic variables; historical dialectology, language contact and diffusion; and attitudes to language.